Ready Beds and Sleeping Bags. KIDS FURNITURE STORAGE 3 PIECE SET - TOY BOX + 6 BIN UNIT + BOOKCASE/BOOKSHELF. 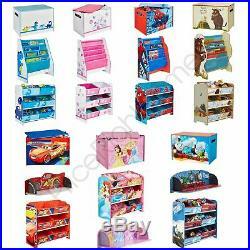 FURNITURE STORAGE 3 PIECE SET - TOY BOX + 6 BIN STORAGE UNIT + BOOKSHELF - Disney Cars, Disney Princess, Thomas & Friends Available. Solid MDF frame with 6 printed fabric storage drawers. Features Lightning McQueen, Cruz Ramirez and Jackson Storm. Easy to assemble screw fixings, all components supplied. Size approx: 60cm (H) x 63.5cm (W) x 30cm (D). Simple T-bolt assembly, all components supplied. Size approx: 59.5cm (L) x 39.5cm (W) x 39.5cm (H). Shaped just like Lightning McQueen. Simple assembly, all components supplied. Size approx: 59.5cm (W) x 20.05cm (D) x 20cm (H). FURNITURE STORAGE 3 PIECE SET - TOY BOX + 6 BIN STORAGE UNIT + SLING BOOKCASE - Dinosaurs, Flowers and Birds, Spiderman & The Gruffalo Available. High quality transfer printed panels. Size approx: 60cm (L) x 39.5cm (W) x 39.5cm (H). Solid MDF frame with 4 polyester sling compartments. For books of different shapes and sizes. Size approx: 60cm (H) x 51cm (W) x 23cm (D). These fantastic Furniture Storage Sets are prefect for any kids bedroom. All items are made from solid MDF construction to the highest children's safety standards. They are great for storing toys, books or games and are ideal for encouraging children to tidy away. Global Megastore is a family-owned and run business based in Berkshire, United Kingdom. We currently stock in excess of 2,500 different items, and this range is growing all of the time. Great Range on Kids Bedding, Duvet Sets, Toddler Beds, Curtains, Toys, Wallpaper, Borders and many more Childrens bedroom accessories. Our opening times are 08:00 - 17:00 Monday - Friday. This listing is currently undergoing maintenance, we apologise for any inconvenience caused. The item "KIDS FURNITURE STORAGE 3 PIECE SET TOY BOX + 6 BIN UNIT + BOOKCASE/BOOKSHELF" is in sale since Wednesday, November 28, 2018. This item is in the category "Home, Furniture & DIY\Children's Home & Furniture\Furniture\Bedroom Furniture Sets". The seller is "global_megastore" and is located in Maidenhead. This item can be shipped worldwide.